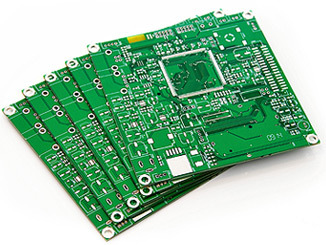 A printed circuit board (PCB) is a plastic board made for connecting electronic components together. These are used in almost all computers and electronics today. The “card” is made of a material that does not conduct electricity, like fiberglass or plastic. Usually copper is etched (set in thin lines) inside the board between the layers of plastic, or on the surface of the board. This makes the electricity go only where it is wanted. Boards can have many different parts which are connected and work together. 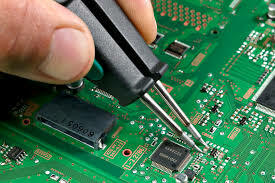 The most common circuit boards are made in large numbers for a specific job, for example to run a computer, a mobile phone or a television. 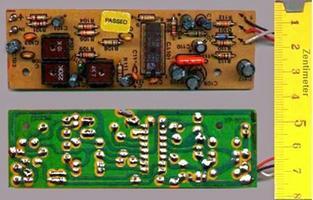 Some circuit boards are made plain so a person can build their own for a new electrical task. Most things that use electricity have at least one circuit board inside of them that makes them run. Printed circuit boards came from electrical connection systems that were used in the 1850s. Originally metal strips or rods were used to connect large electric components mounted on wooden bases. Later, the metal strips were replaced by wires connected to screw terminals, and wooden bases were replaced by metal frames. This let things be smaller, which was needed as circuits became more complex with more parts. Thomas Edison tested methods of using metals on linen paper. Arthur Berry in 1913 patented a print-and-etch method in Britain. In 1943, Paul Eisler (Austrian), working in the United Kingdom, patented a method of etching the conductive pattern, or circuits, on a layer of copper foil attached to a hard base that did not conduct electricity. Eisler’s technique was noticed by the US military and they started to use it in new weapons including proximity fuses in World War II. 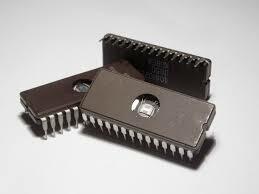 His idea really became useful in the 1950s when the transistor was introduced. Up to that point, vacuum tubes and other components were so large that the traditional mounting and wiring methods were all that was needed. With the introduction of transistors, however, the components became very small, and manufacturers needed to use printed circuit boards so the connections could also be small. Plated through-hole technology and its use in multi-layer PCBs were patented by the U.S. firm Hazeltine in 1961. This allowed much more complex boards, with components placed closely together. Integrated circuit chips were introduced in the 1970s, and these components were quickly incorporated into printed circuit board design and manufacturing techniques. Today the Printed Circuit Board can have up to 50 layers in some applications.